British Prime Minister Theresa May on Monday attempted to resuscitate her rejected European Union divorce deal, setting out plans to get her Brexit agreement approved by Parliament after securing changes from the EU to a contentious Irish border measure. Outlining what she plans to do after Parliament voted against her deal last week, May said she had heeded lawmakers' concerns over the so-called "Irish backstop," which is intended to guarantee there are no customs checks along the border between EU member Ireland and the U.K.'s Northern Ireland after Brexit. May, promising a more "flexible, open and inclusive" approach to engaging Parliament in future EU negotiations, and said she would be "talking further this week to colleagues … to consider how we might meet our obligations to the people of Northern Ireland and Ireland in a way that can command the greatest possible support in the House." But even though May insisted her Brexit Plan B was "not a rerun" of her original EU exit deal, opposition lawmakers quickly complained of déjà vu. "This really does feel a bit like Groundhog Day," said Opposition Labour leader Jeremy Corbyn, referring to the 1993 film starring Bill Murray, in which a weatherman is fated to live out the same day over and over again. The EU has repeatedly insisted it will not renegotiate the withdrawal agreement U.K. parliamentarians voted down last week. Several EU foreign ministers said Monday that reopening the deal was out of the question. Lawmakers are due to vote on May's Plan B and any possible amendments on Jan. 29, two months before Britain is due to leave the EU on March 29. Britain and the EU sealed a divorce deal in November after months of tense negotiations. But the agreement has been rejected by both sides of Britain's divide over Europe. Brexit-backing lawmakers say it will leave the U.K. tethered to the EU's rules and unable to forge an independent trade policy. Pro-EU MPs argue it is inferior to the frictionless economic relationship Britain currently enjoys as a member of the bloc. 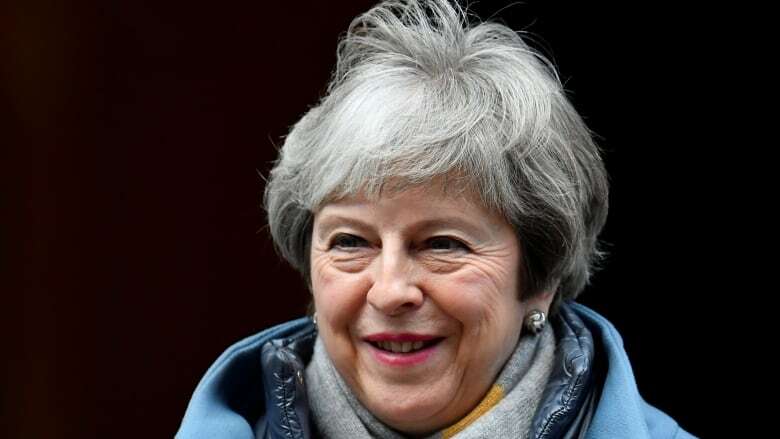 After her deal was thrown out last week by a 432-202 vote in Parliament, May said she would consult with lawmakers from all parties to find a new way forward. 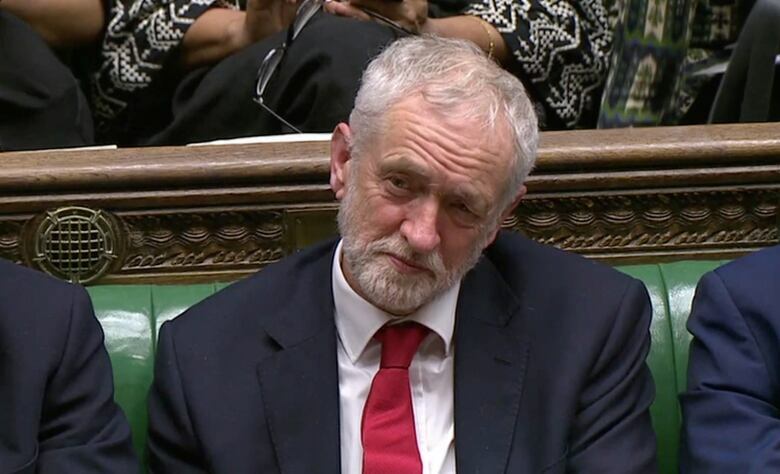 But Corbyn called the cross-party meetings a "stunt," and other opposition leaders said the prime minister did not heed their entreaties to rule out a "no-deal" Brexit and retain close economic ties with the EU. On Monday, May rejected calls from pro-EU lawmakers to delay Britain's departure from the bloc or to hold a second referendum on whether to leave. 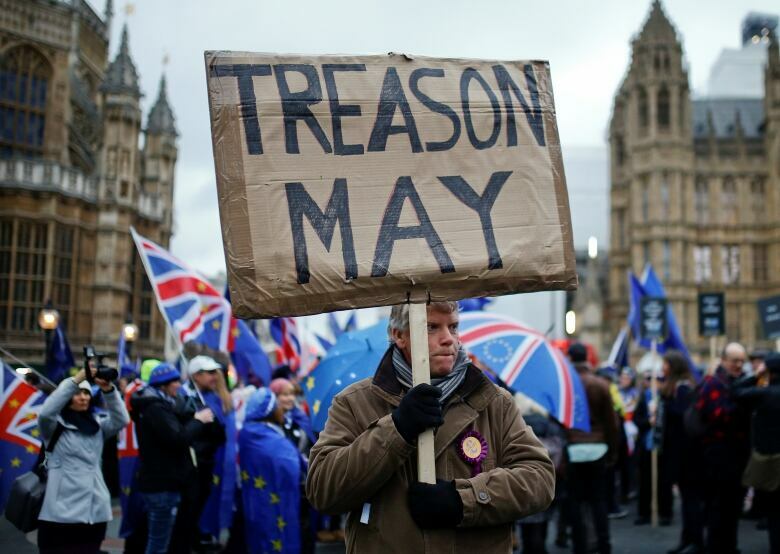 She said the EU was unlikely to extend the March 29 exit deadline without a plan to secure Parliament's approval of a deal, and that another referendum would strengthen the hand of those seeking to break up the U.K. and undermine Britons' faith in democracy. She made some concessions to opposition demands, including waiving a £65 ($111 Cdn) fee for EU citizens in Britain who want to stay permanently after Brexit. But May's main goal is to win over pro-Brexit Conservatives and her party's Northern Irish ally, the Democratic Unionist Party. Both groups say they will not back the deal unless the border backstop is removed. The Irish backstop proposes to keep the U.K. in a customs union with the EU in order to avoid checks and border infrastructure between Northern Ireland and Ireland. It is meant as a temporary measure that would last until a permanent solution is found. But pro-Brexit U.K. lawmakers fear the backstop would indefinitely force Britain to abide by EU trade rules. Polish Foreign Minister Jacek Czaputowicz broke ranks with his EU colleagues Monday by suggesting the problem could be solved by setting a five-year time limit on the backstop. But Irish Foreign Minister Simon Coveney reiterated the more widely held EU opinion, saying that "putting a time-limit on an insurance mechanism, which is what the backstop is, effectively means that it's not a backstop at all." Crashing out of the EU? Britain's political impasse over Brexit is fuelling concerns that the country may crash out of the EU on March 29 with no agreement in place to cushion the shock. That could see tariffs imposed on goods moving between Britain and the EU, sparking logjams at ports and shortages of essential supplies. Labour Party Brexit spokesperson Keir Starmer said Sunday a no-deal Brexit would be "catastrophic," and it was "inevitable" Britain will have to ask the EU to extend the two-year countdown to exit. Labour Yvette Cooper, said May was shirking her responsibility to the country by refusing to take "no deal" off the table. The EU, meanwhile, expressed frustration with British indecision. Chief EU Brexit negotiator Michel Barnier said while the EU would not amend the legally binding withdrawal agreement, it was ready to adjust the political declaration — a non-binding statement on future relations that forms the second part of the divorce deal.